I don’t know about you, but even for an inveterate cooking enthusiast like myself, the dog days of summer take their toll. I like to keep time spent over a hot stove to a minimum, so I turn to lots of quick and easy dishes that need little or no application of heat. Last night, for example, we had an insalata caprese, cured olives, pineapple and, to start things off, some grilled clams. and grill them just until they open, which usually takes no more than 5 minutes. 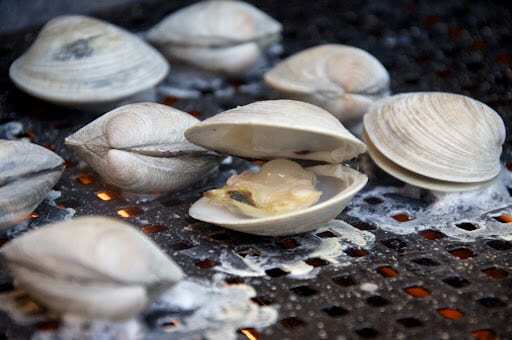 Clams tend to open at different rates, so to avoid overcooking remove those that have already opened to your serving dish while the others cook, until they’re all done. NB: Use tongs and handle your clams gingerly, keeping them perfectly horizontal if you can to avoid losing their tasty brine. You can serve your grilled clams as is, or with a drizzle of oil and/or a squeeze of lemon juice. But for even more flavor, try napping some freshly made salmoriglio sauce onto each clam. as pictured above. It complements the taste of the clams perfectly, and as when the leftover sauce mixes with the juices on the bottom of the dish, it makes for exquisite dipping with a crusty piece of homemade bread! This technique for grilled clams works for other mollusks. Mussels (cozze) are particularly common, and uncommonly delicious, made this way. 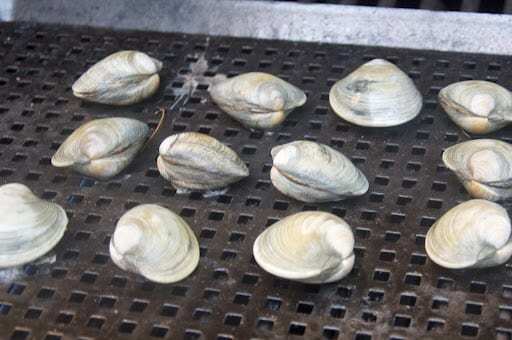 Clams tend to open at different rates, so to avoid overcooking remove those that have already opened to your serving dish while the others cook, until they're all done. NB: Use tongs and handle your clams gingerly, keeping them perfectly horizontal if you can to avoid losing their tasty brine. You can serve your clams as is, or with a drizzle of oil and/or a squeeze of lemon juice. But for even more flavor, try napping some freshly made salmoriglio sauce onto each clam. as pictured above. It complements the taste of the clams perfectly, and as when the leftover sauce mixes with the juices on the bottom of the dish, it makes for exquisite dipping with a crusty piece of homemade bread! Never thought of grilling clams! What a great idea! Frank – I'm likely to have just some prosciutto and mozzarella with tomato salad on these hot days of summer too. The grilled clams with the salmoriglio sounds like a fantastic way to keep the heat outdoors but still dine on great food. Thanks, Ellen! Do let us know how you and your guests like them! What a fantastic idea. I am going to make these and serve them with wine on my patio the next time friends come to visit. Fabulous!